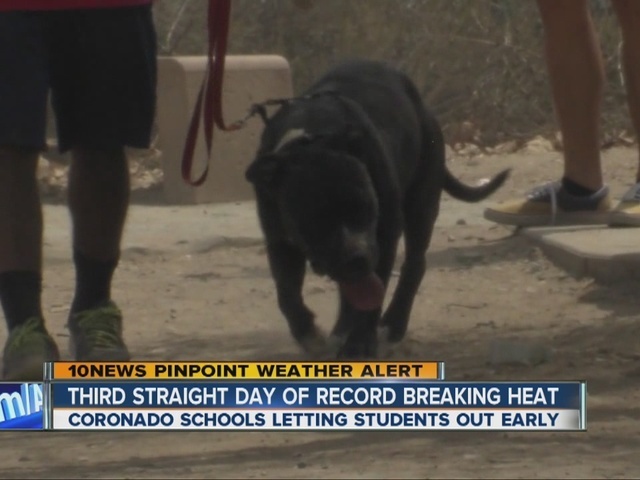 A record-breaking late-summer heat wave kept the San Diego area roasting for a third consecutive day Thursday. A stubborn high-pressure canopy over Southern California and the remnants of Tropical Storm Linda made for more muggy, toasty conditions in advance of a gradual cooling trend expected to begin Friday. 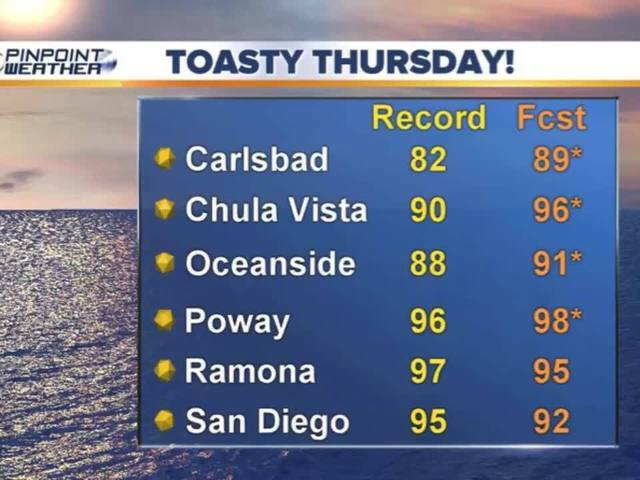 Afternoon temperatures ranged from the mid-80s to the high-90s along the coast, and the mid-90s to triple digits inland, according to the National Weather Service. As was the case Tuesday and Wednesday, the oppressive swelter set a few local heat records. 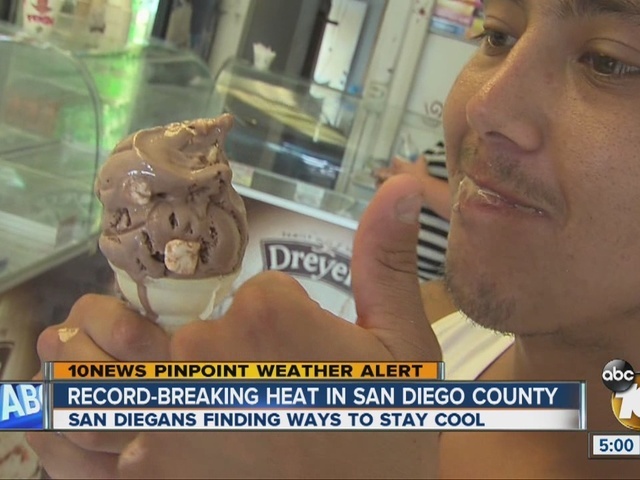 Chula Vista saw a high of 94 degrees, beating the former milestone for this date of 90, set in 1990; and the thermometer reading in San Diego climbed to 96, exceeding the former maximum mark of 95, recorded way back in 1878. Travis Reichard hit south Mission Beach on Thursday to cool off in the ocean. "I have no air conditioner at all," Reichard said. It has not been easy on him, as he told 10News, "You have to have like three or four box fans pointed at you at once." Let's just say he has not been wearing flannel pajamas to bed. "You kind of live in your skivvies," he added with laughter. He has been taking a cold shower before work, before dinner and before sprawling out in front of his fans. "Just try to stay as cool as you can. Use some body spray if you have to. "Otherwise you just start to smell like this nasty funky mess and it's just … it's gross!" Authorities again urged the public to take precautions against dehydration, heat stroke and other heat-related illnesses. People were advised to stay well-hydrated; avoid working in the sun; never leave children or pets in parked cars, which can rapidly become death traps in high heat; provide plenty of water to pets and livestock; and check on neighbors and relatives, especially the elderly. On Thursday night, unusually high temperatures are expected to linger due to cloud cover resulting in part from the dissipating tropical storm south of the U.S.-Mexico border. Then, increasingly temperate and comfortable conditions should develop through the weekend and into next workweek, according to forecasters.